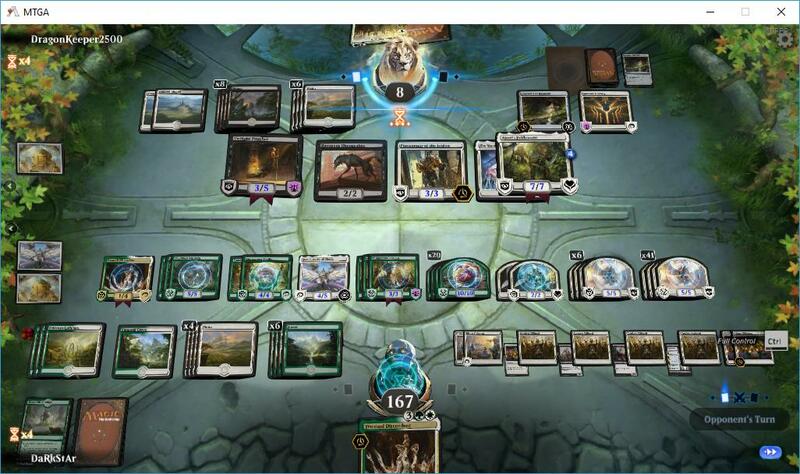 Killing opponent's Multani, Yamivaya's Avatar with Merfolk Trickster. This awesome guy didn't concede so I could play out my deck.. Sane person: "Why don't you just concede?" Big Red (me) vs Arclight drakes. I've just flipped 2 maps, have lots and lots of land in play. He's got a single Arclight in play but decided to go for it with a drake and terminal velocity. Luckily I've been saving a shock and 2 lightning strikes in my hand so I zap the hasty drake (but had to use 2 treasures). He holds back his Arclight to block my warboss and 1 token. He's at 17 life and tapped out. I do the math (the last map scryed banefire) and go for 3 damage (trading warboss for the Arclight). I have 6 mountains, 2 flipped maps and 4 treasures and am still holding a lightning strike. He's at 14... I strike him eot and then finish him with banefire, simple... All I have to do is survive a turn. He gets scared of my tokens and drops an enigma drake and electromancer to block but doesn't use the terminal velocity on his drake (I'm at 13 life, wouldn't have killed me anyway), so lightning to face, draw another banefire (fitting!) And banefire for 11. Is it just me or banefiring for 10+ just feels so damn satisfying? And I had a damn op last night that would't let me do my first Vivian ultimate. You play the lottery lately? Anyone who plays mono-red probably knows that flame of keld usually only draws you 2 lands + an irrelevant card, but sometimes it realy shines like yesterday for me. I was playing against turbo-fog (urgh..). flame of keld on step 3 ( last turn flame of keld drew me shock, lightning strike and a viashino pyromancer). I have a risk-factor in the gy I can jump-start. I attack, and get fogged keeping the steamkin and fanaticals back to avoid settle (was expecting it), luckily op has everything he needs but hasn't found nexus yet. I pretty much got to win this turn. 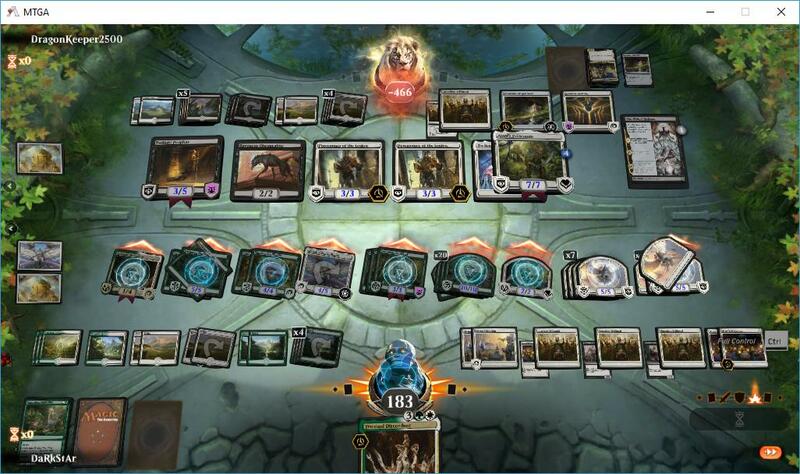 So, I risk factor, ditching the viashino (he could take 6 damage or give me 3 cards), he gives me cards (big mistake!). I have 2 mana left, steamkin goes to 2 counters and I draw 2x shock and wizard's lightning. I give opp a Nice! Wizards lightning to face: 5 damage and 3 counters on steamkin. (He's at 17). Shock to face: 4 damage and 4 counters on steamkin. (He's at 13). Get 3 mana from steam kin and shock to face: 4 damage and he returns the Nice! (He's at 9). Lightning strike to face: 5 damage and he's at 4. Sac a fanatical: He's at 1. Always fun to beat up on control decks. **** Teferi, seriously. RNA draft against a mill deck. He had 5 cards left in library, I had a lot more. He's dead right? I activate Screaming Shield, move it, and then activate it again and say "good game". But no! On his draw step, he activates Junktroller targeting Clear the Mind in his graveyard! I'm like, wth, and then I notice I'm holding Consecrate // Consume and use Consecrate targeting Clear the Mind. LOL. I couldn't imagine casting Consecrate in limited ever, but then it literally won me the game. Who can figure out what has happened here? Looks like someone ran out of deck. But why on Darkstars turn, before combat...he conceded? Assuming by the fact that Darkstar has 4 mana tapped, I presume Conclave Tribunal to exile Doom Whisperer happened during main 1. He board wiped me and played an early Lich's Mastery. I couldn't do much against it, but my luck was that I flipped a Legion's Landing earlier, so I could get some life and let him exile a couple cards. But I could never built up a good board state because he always destroyed every creature I had and drew a lot of cards because of life gain. Still I refused to give up because as long as he doesn't cast a win condition, I could still win in the long run. His win condition was Twilight Prophet which I could destroy one time and after he revived it I also had a Conclave Tribunal for it. The second win condition was a Doom Whisperer which he got in one of his last draws and it nearly finished me with the help of Chance for Glory. 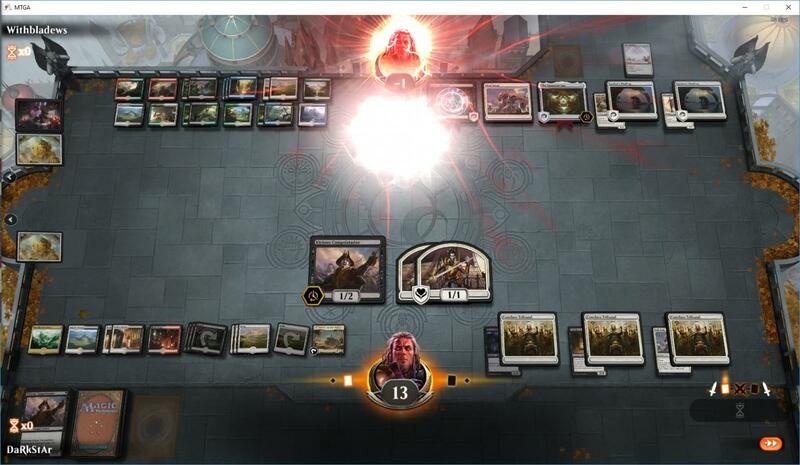 But I top-decked the last Conclave Tribunal in my deck and therefore he had no win condition left and would eventually die to exiling his Lich's Mastery. I have Tyrant, Chupa, Thorncrown and Deathbloom Thalid on board. Op has Forerunner of the Empire on board and one life. Oh come on and have some fun. Might have not been play of the day but it sure wasn't something they were thinking would happen. I was pretty far down in life myself. If that 1/1 hadn't generated there was no guarantee I would have won.